St Luke's new campaign for RNIB launched this week. Our brief was to begin the journey to recruiting a new generation of supporters for RNIB, by putting the issue of sight loss on to their agenda. People have a very superficial understanding of sight loss and its implications. In fact, without the sort of support RNIB offers, losing your sight can mean losing the life you had and the future you dreamed of. With this campaign, we're hoping to create engagement and empathy with the issue of sight loss by encouraging people to consider how losing their sight would affect them personally by asking them the question ‘What would you lose from your life if you lost your sight?’ and inviting them to tell us their answers. 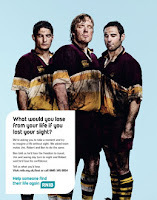 The campaign shows groups of real people including rugby players, chefs and hikers, in the midst of their activity with their eyes shut, contemplating their own answers to the question. What would you lose from your life if you lost your sight? RNIB and issues of sight loss have had presence this week at the Labour party conference. Michael Foster MP took RNIB's maze challenge where people we're blindfolded and had to carry out daily tasks like shopping and using the ATM. He said; “Taking RNIB’s Maze Challenge gave me a new perspective on the huge challenges people face when they begin to lose their sight and the patchy support available in many areas," Michael said. "It is time for the Government to prioritise support at the time of sight loss - it is unacceptable that when you most need it, you may struggle to find the right help." What a great way to get a politician to think about the issue.